Nothing says “oasis of paradise” like the St. Bart’s getaway home owned by Kate and Matt Holstein. 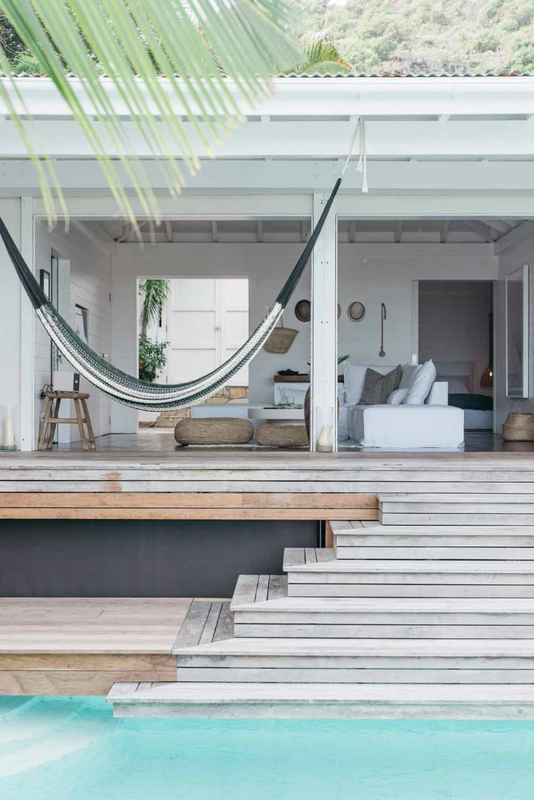 This incredible space features a seamless transition between indoor and outdoor living spaces and it’s fresh and chic design is to-die-for. 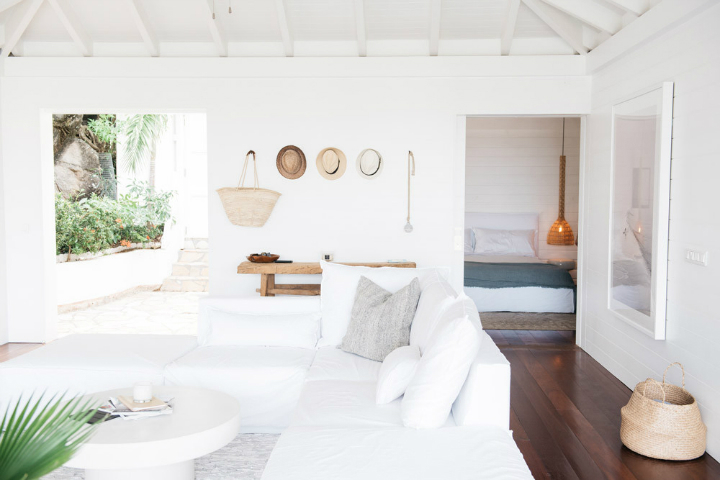 This article goes into depth of the house, room by room, to show you the beauty of this St. Bart’s paradise property. With a unique design of half covered, and half uncovered space, this property, only a five minute walk from the local beach Anse des Cayes,is a need-to-see property. With an open concept design, the living room features positive vibes and an earthy tone. The crisp white walls are accented by the brilliant green of the courtyard beyond and the minimalist design keeps the room looking modern and fresh. 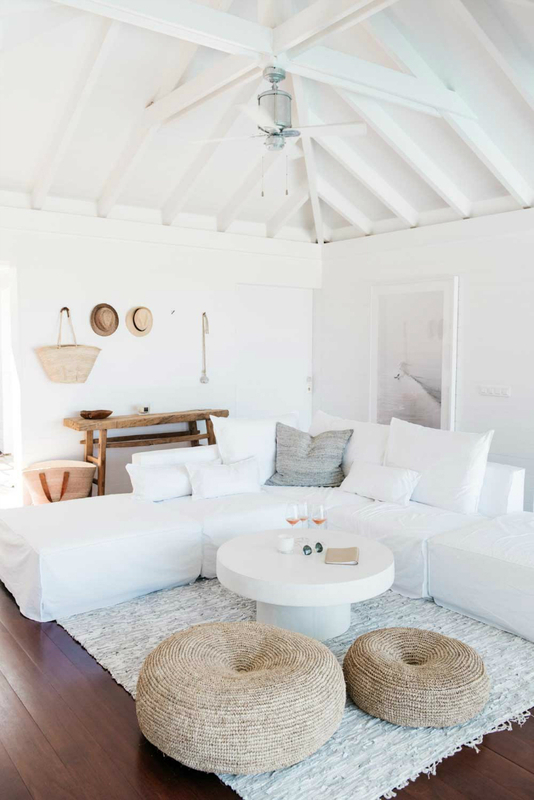 Various decor items line the walls and table tops, including straw hats and beige tote bags which only add to the relaxed feel of this getaway. 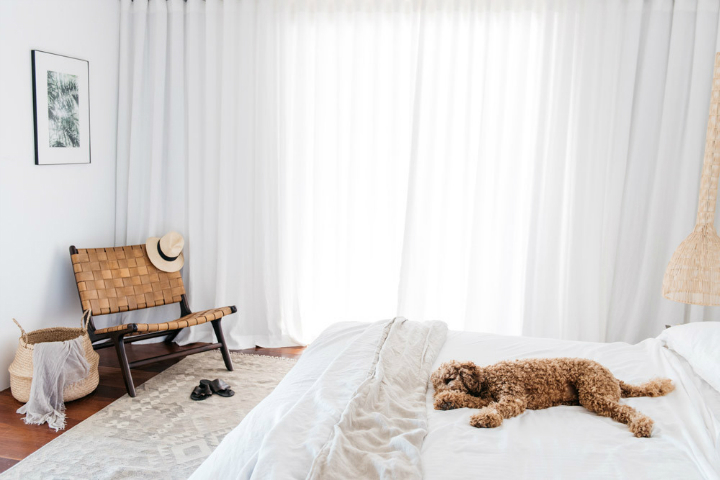 The master bedroom in this getaway property follows the same minimalistic design of the main living area, and incorporates wooden and wicker furniture to add to the earthy feeling, tying the spaces together. The room is made complete by a cozy reading corner set alongside the natural lighting provided by the sheer white curtain covered windows. No master bedroom would be complete without a master en suite attached. The en suite at this piece of paradise property features Italian lime plaster and neutral tones for a crisp effect. 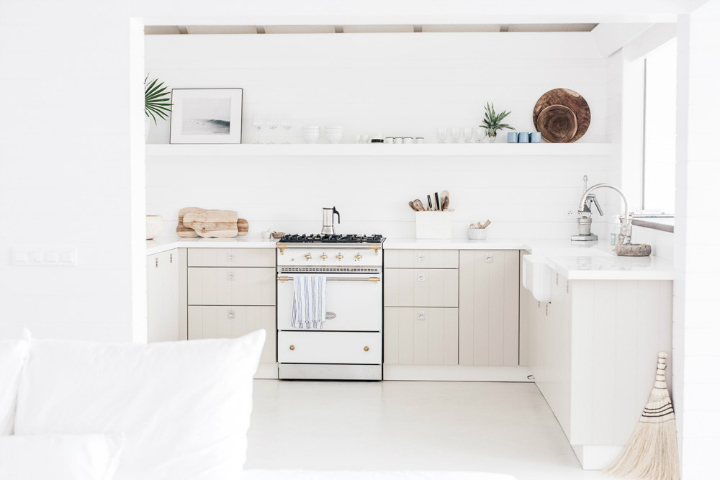 Raised white sink bowls keep the space modern and dynamic and the hanging towel bars and added storage space ensure it is always looking tidy. The kitchen is lit with all natural lighting and features open shelving for a custom look. The countertops, cabinets, and floors are all finished in light colours enhancing the beauty of the airy space. A large open window off of the kitchen leads to the outdoor patio area. 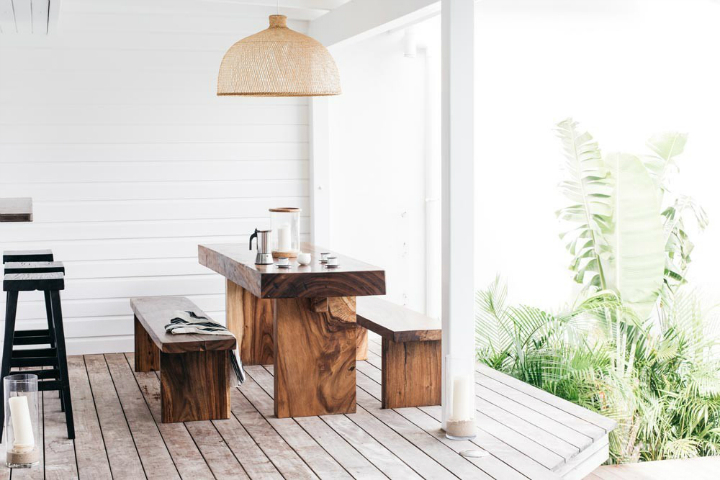 Leading into the outdoors, the patio features a breakfast bar with counter seating and a tigerwood table for lounge outdoor seating on the back patio. Off to the side sits a hammock and a hanging chair for further lounge space and a relaxed feel. The patio is also covered over so it can be enjoyed regardless of the weather. 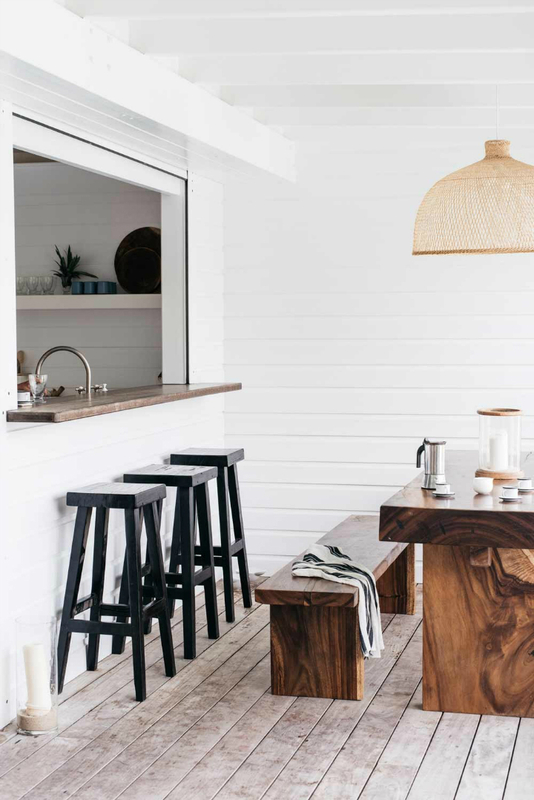 The transition between the outdoor and indoor spaces is spectacular and the simplistic and earthy tones of the indoor spaces help the transition to be so effective.